Libya is to have its first nationwide organisation aiming to represent all its municipalities. The creation of the Association of Libyan Municipalities (ALM) was agreed by 47 municipal leaders over a weekend meeting in Sabratha. The new body will have a nine-man elected leadership drawn equally from three local authorities from the south, east and west of the country. The ALM is a direct response to the widespread lack of central government funding. The clear hope is that a united voice will ring louder in the corridors of power. But there is also the feeling that successful ceasefires and peace agreements have been cut at local levels by municipalities working with local tribal elders rather than by any government intervention. At the start of the Libya Dialogue, local government was described as an important “stream”. The then UNSMIL chief Bernadino Leon flew mayors to Brussels for meetings. This weekend’s meeting was originally called by Sabratha mayor Hassen Dhawadi for a week ago but was postponed because few of the 60 invitees was able to come at such short notice. Otman Gajiji, former chairman of the Central Committee of Municipal Elections of Libya hailed the ALM’s creation as “a move in a positive direction to create a unified voice for all municipalities”. 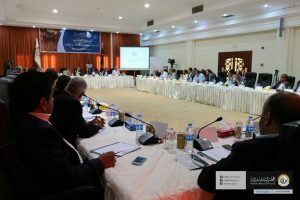 At the weekend, a three-strong steering committee was chosen which included representatives from Sabratha and Nalut. The aim is to have the south and east put forward their candidates. However, it seems likely that the initial response from eastern towns will be cautious. Tobruk was the only municipality in the east that came to the Sabratha gathering. There is also unease that several towns within the LNA’s area of operations, have now had military officers appointed to be their mayors.